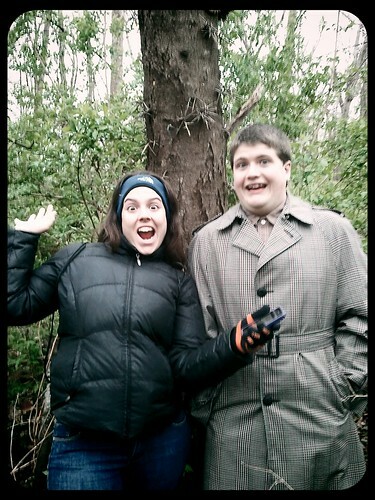 When Ryan visited, he introduced Maggie, Marisa and me to geocaching. 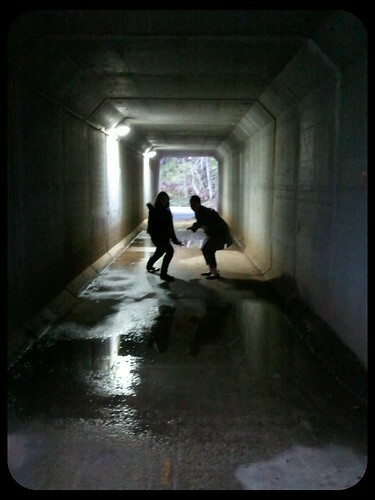 Marisa and I enjoyed it so much, we’re planning to make it a regular activity. 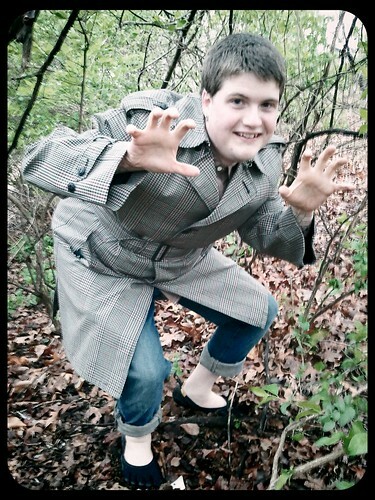 Last Saturday evening, we brought Brandon along on our Geocaching expedition. 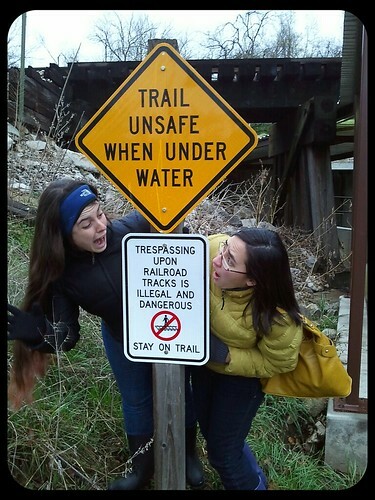 We decided to go on foot, and to try to find caches along the bike trail. It was around 35F, so we dressed warmly. Though it was his first time geocaching, Brandon found the first cache we sought. 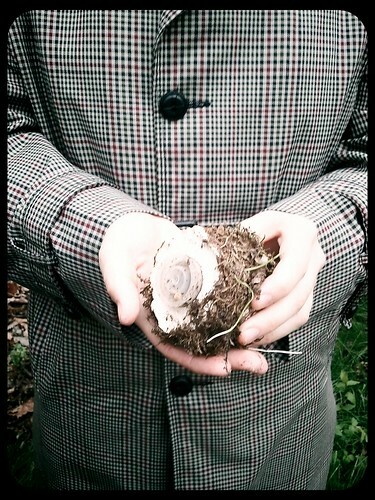 I think it helps that he classifies geocaching as treasure hunting! We did a surprising amount of tromping through the woods, through thorny trees and underbrush. 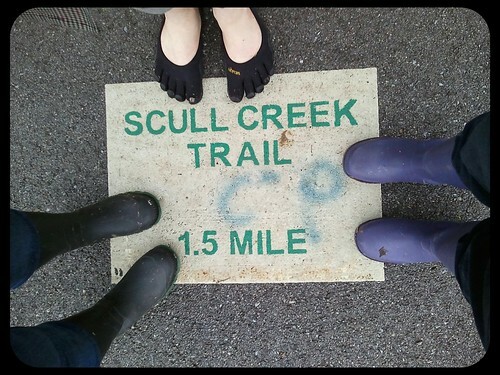 It was wet and muddy out because it had been raining throughout the day, so we clad our feet appropriately. Marisa was kind enough to let me borrow her purple boots. Additionally, did a bit of walking along the trail. This 1.5 mile marker was from about halfway through our search, though it is misleading because we did not strictly stick to the trail (we did circle around a lot, though, so I can’t imagine we walked fewer than 2 miles that evening, and am fairly sure we walked around 3). 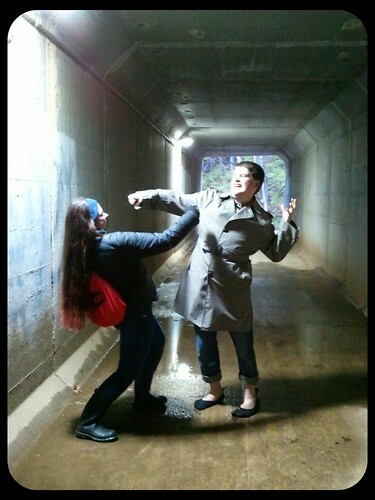 While I’d walked along portions of the trail before, I had not gone through any of the tunnels. 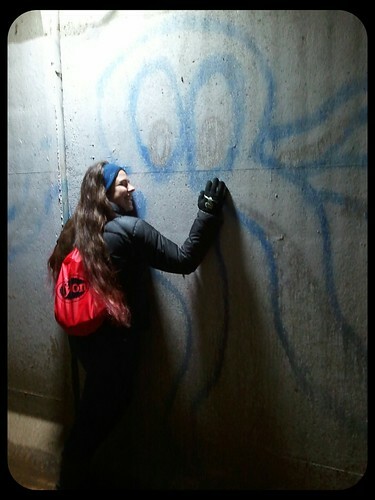 We found some cool octopus graffiti, which Marisa adored. We could see where a lot of graffiti had been painted over with white. I think it’s too bad. I haven’t seen any gang or violent-toned graffiti in Fayetteville, so it seems a shame that a lot of cool stuff is consistently painted over just for the sake of not having graffiti. 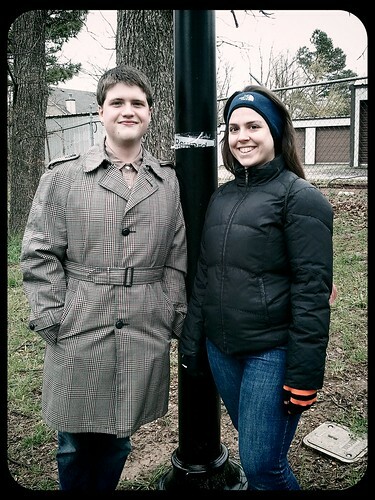 We only found 1 out of the 4 caches we planned to get. 1 looked like it had been missing for months, but we plan to get the other 2 at a later date, as our ability to search was hampered by the growing darkness (or our own shortcomings…). We should probably add flashlights to our geocaching gear. Speaking of geocaching gear, Marisa ordered some cool stuff! 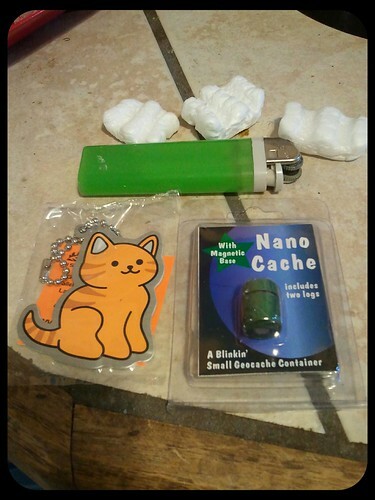 She got a nano cache for us to place somewhere, and a trackable cat to place in a cache around town. The lighter is for size reference. 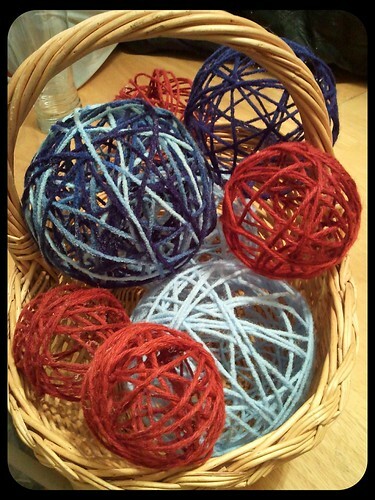 Last Saturday, Maggie, Marisa and I decided to make decorative yarn balls based off this tutorial. 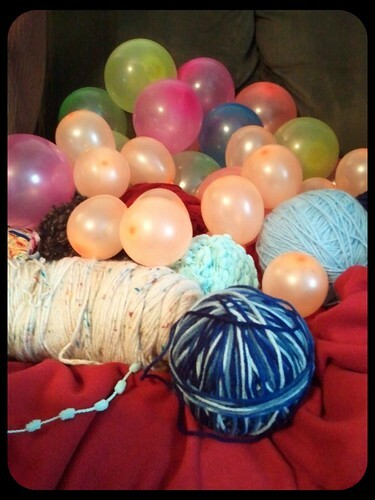 First we chose our yarns and inflated balloons. 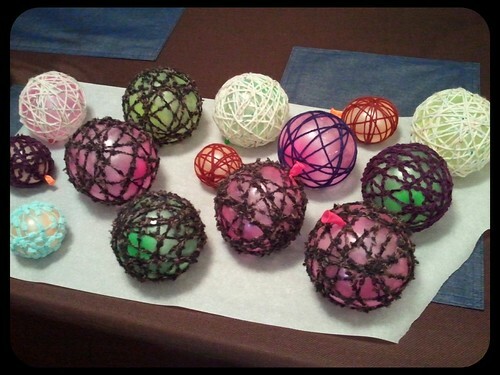 We used the larger size suggested in the tutorial, as well as smaller water balloons so we could have varied sizes. We took the time to enjoy ourselves with the balloons before properly starting the project. 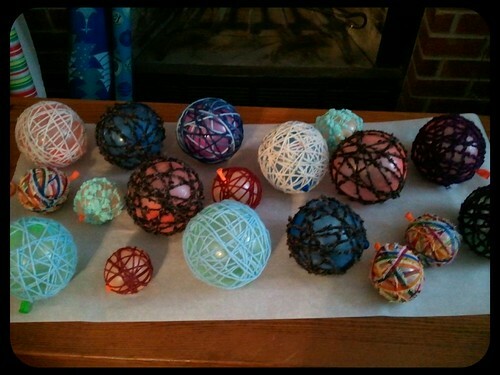 We dipped the yarn in the water/glue mixture, and wrapped it around the balloons, then set them on parchment paper to dry (we let ours dry for nearly 48 hours before popping and removing the balloons). 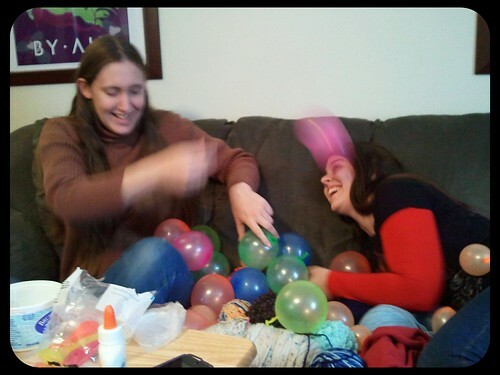 The yarn balls looked like they were collapsing when we popped the balloons, and the balloons pulled inward. 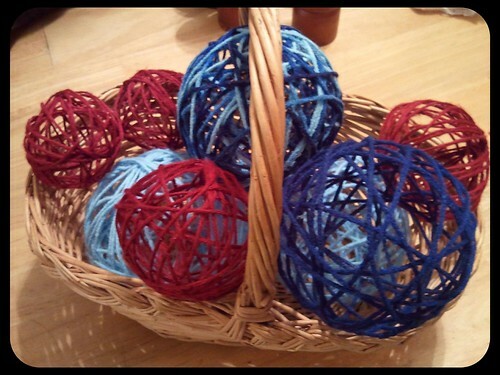 The yarn quickly sprung back into place, however, and turned out rather well. 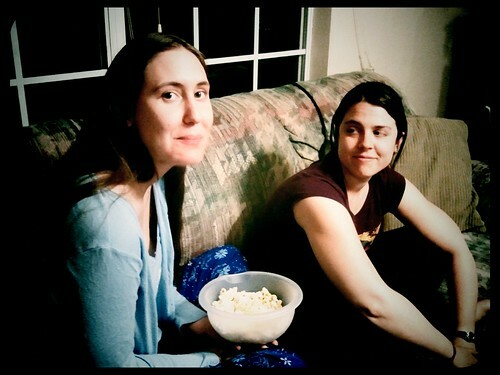 I got to hang out with Maggie and Marisa a bit tonight, and took some snapshots of our shenanigans with Vignette, so I thought I’d share them. They recently got a new-in-box record player off Craigslist. 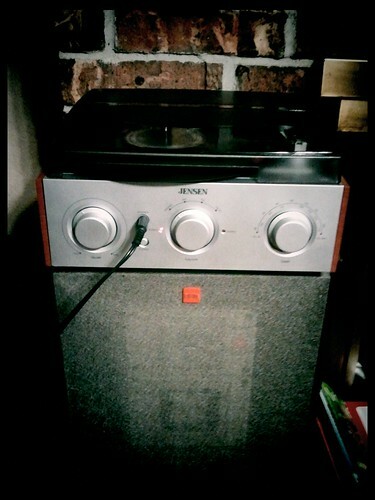 It was playing records too quickly, so we opened it up, determined what was wrong, and fixed it! 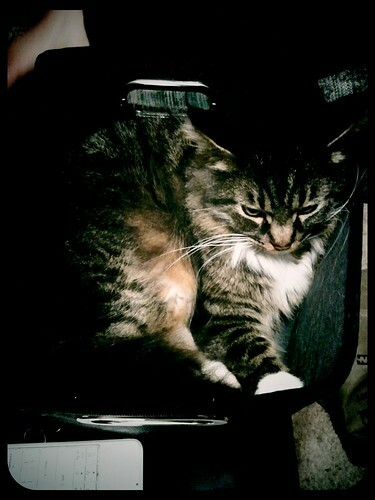 Also, Bosie hung out in a basket while we listened to Simon and Garfunkel. Fun times.